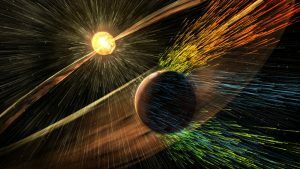 Radiation exposure on a deep space journey to Mars could cause long-term brain damage, based on recent findings from the University of California-Irvine School of Medicine. Cosmic radiation constantly bombards Earth, but our planet’s magnetic field deflects the worst rays. The same rule does not apply to Mars. But too few astronauts have been exposed to lengthy bouts of cosmic radiation on moon trips for an in-depth brain study. The closest example on Earth comes from cancer treatments and nuclear bomb patients, both of which have higher concentrated amounts of radiation than one would find in deep space. Intentional human studies of the consequences are impossible — I mean, would you want to volunteer? Animal models represent one of the only ways to address how a constant lower dose of radiation over a long period could impact the brain. So, this study began at the NASA Space Radiation Laboratory in New York, where scientists exposed mice and rats to radioactive isotopes of titanium and oxygen, which are both components of cosmic rays. Once complete, this team sent their specimens to radiation oncologist Charles Limoli at the University of California-Irvine School of Medicine. The galactic cosmic rays also impacted a process called “fear extinction.” When you undergo a terrifying experience like drowning, you develop a fear related to that experience, such as a fear of water. With gradual exposure to that fear-inducing experience — spending time around or in water after near-drowning — you become accustomed to the activity again, and the fear is extinguished. But when the brain encounters space radiation, Limoli said that “fear extinction” stops occurring. This pattern could lead to higher levels of anxiety, impaired decision-making and depression if the same trends hold in humans. This research reveals more specifics on the impact of space-level radiation on the brain, said Nuclear engineer and former NASA researcher Lawrence Townsend, who wasn’t involved with the study. While human travel to Mars is years away, Limoli said this research could improve radiation treatments for cancer, by describing the long-term neurological side-effects.